The Liberty is an “All Inclusive” 501 sq. ft. 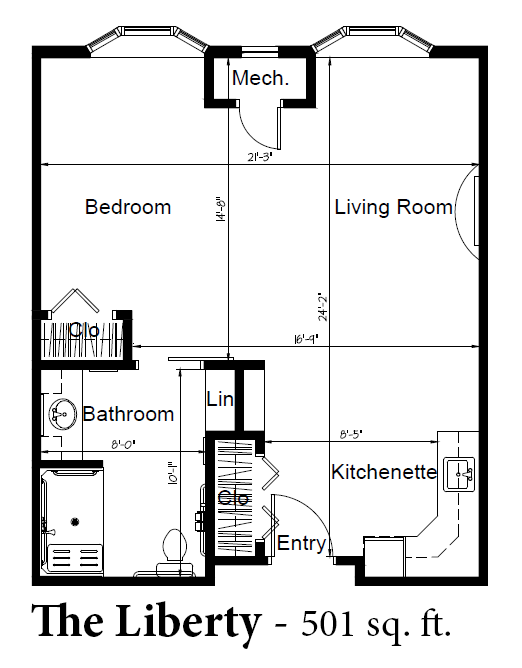 Studio apartment with a large open floor-plan, modern kitchenette, and beautiful spacious bathroom. Bay windows in the living room and bedroom areas take advantage of natural lighting bringing the vibrancy of the outdoors into the space. This Studio apartment is large due to it’s functional layout and open yet clearly defined spaces. In our Memory Care Communities special attention is given to security, safety and life enriching activities. Available in both our Memory Care and Memory Care Plus options.